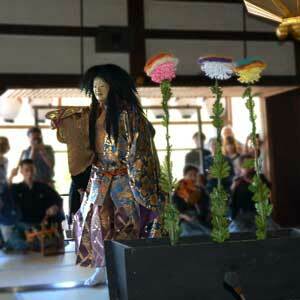 Horin-ji Tempe, situated on the hillside of the Arashiyama Mountain, has a long history. It starts approximately 1300 years ago, in 713, with the construction of Gyoki Bosatsu (Bodhisattva) by the order of Emperor Genmei. Dosho (道昌), a monk who is a disciple of Koubou Daishi(弘法大師), placed the Kokuzo Bosatasu (Akasagarbha Bodhisattva) as a principle image of Buddha, for which a large temple was built. The temple was later given the name “Horin-ji” by Emperor Seiwa in 874. In the book “Makura-no-soshi” (the Pillow Book, 枕草子), written by Sei Shonagon (清少納言, a poet of the Heian period), the temple has been praised as one of Kyoto’s representative temples. Its auspiciousness was also described in “Konjaku Monogatari” (今昔物語, a collection of stories written during the late Heian period). The temple was severely damaged during the Onin War (応仁の乱, 1467), but it was restored under the leadership of Toshiie MAEDA. In 1606, Emperor Go-Yousei bestowed an honorific mountain prefix as Mt. Chifuku (the mountain of wisdom and good fortune) upon the temple. In the Genroku era (1688 - 1704), Keishoin (桂昌院), the biological mother of Tsunayoshi TOKUGAWA (徳川綱吉, the fifth shogun), professed her faith and supported for the temple, which contributed to its rise in prosperity along with an expansion of its grounds. During the Kimon Incident (禁門の変) of 1864 at the end of the Edo period, however, much of the main hall was burned down. The main hall and gate of the temple, with the two-storied pagoda have since been rebuilt. The principal image of Kokuzo Bosatsu has been affectionately referred to as “Sagano no Kokuzo-san”, and is revered as the provider of wisdom, happiness and prosperity. 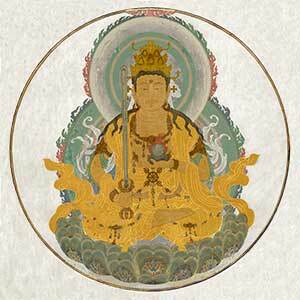 It also draws many worshipers as the guardian for those born in the year of the ox and tiger. The name Kokuzo Bosatsu refers to the Bodhisattva that processes a storehouse (zo, 蔵) of treasures that is unlimited (ko, 虚) like the sky (ku, 空), also known as “Noman Shogan no Kokuzo” as the one who will bring out and provide anything anybody wishes for from its storehouse. Highlights of Horin-ji Temple The Togetsu-kyo Bridge, spanning the clear running waters of the Ooi-gawa River, is a celebrated scenery in Arashiyama. Until the Edo period, the bridge was called Horin-ji Bridge because it is said that Dosho (道昌), of Horin-ji Temple, firstly built the bridge when he was repairing the river. If you look toward Arashiyama Mountain from the bridge, you can see the pagoda of Horin-ji Temple, halfway up the mountain. After entering the main temple gate, on the way up the stone steps, you will find the Dendengu-shrine, enshrining the guardian deity of electricity and radio waves. At the top of the steps, you will see the main hall of the temple. 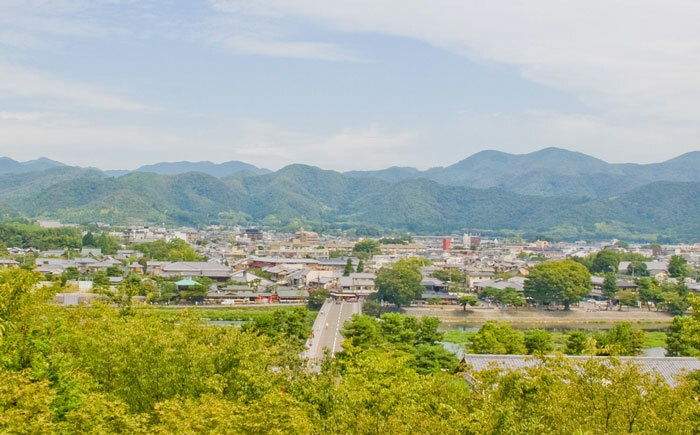 Towards the left is the pagoda, and on the right is an observation deck called the “Butai (stage)”, where you can have a wonderful view of the Togetsu-kyo Bridge, the whole Sagano area, as well as the city district of Kyoto and the Higashiyama mountain range. Horin-ji Temple is particularly known for a ceremony called “Jusan Mairi”. It is a coming of age ceremony for boys and girls who turned 13 years old (counted according to the traditional Japanese system where you are one when you are born). They visit the Kokuzo Bosatsu to pray for wisdom, happiness and health so that they will become a fine adult and live an enriching life. After the visit, however, it is said that the individual is not allowed to look back until he/she finishes crossing the Togetsu-kyo Bridge, or else the wisdom he/she received from Kokuzo Bosatsu will be taken back. Since ancient times, many poets, writers, and craftsmen lived in seclusion within the temple complex. This led Horin-ji Temple to be also well known as an auspicious place for artists. The Kokuzo Bosatsu (Akasagarbha Bodhisattva), the principle image of Buddha of Horin-ji Temple, has been affectionately revered as the provide of wisdom and prosperity by the people of Kyoto. The ceremony of Jusan Mairi (Jusan=13, Mairi=visit) originates from Emperor Seiwa at the beginning of Heian era (794-1185). When Emperor Seiwa, who started reigning the country at a very young age, turned 13 years old (counted according to the traditional Japanese system where you are one when you are born), a coming of age ceremony was held in Horin-ji Temple. 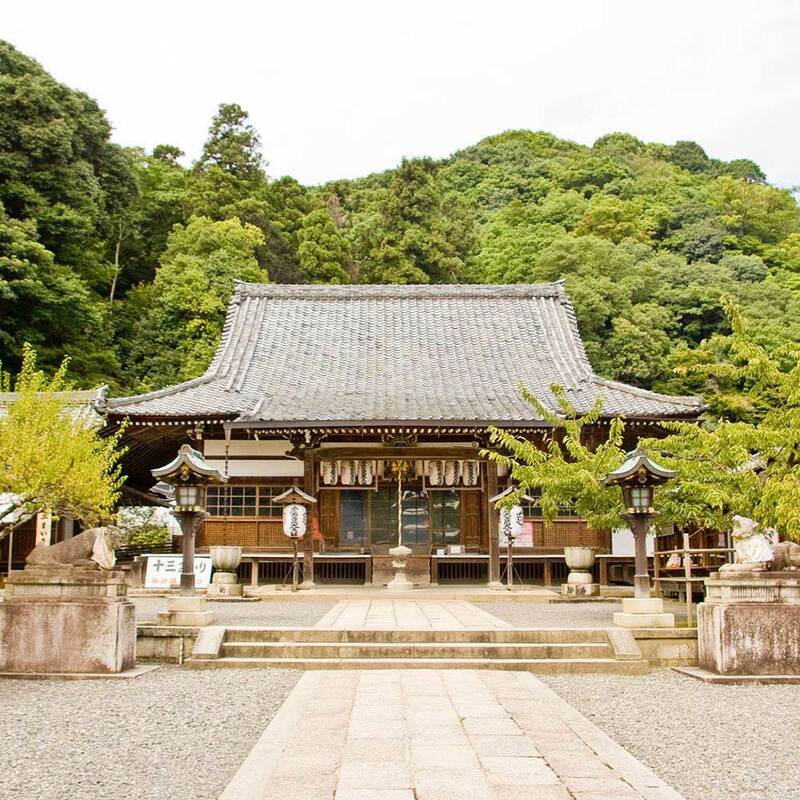 Ever since then, Jusan Mairi has become a ritual to cerebrate the coming of age for boys and girls by paying a visit to the Kokuzo Bosatsu of Horin-ji temple to pray for wisdom. In Japan today, 13 years old is still considered an important turning point of life that the Jusan Mairi ceremony is a rite of passage, taken very seriously, for children to receive wisdom and to become a fine adult and live an enriching life. 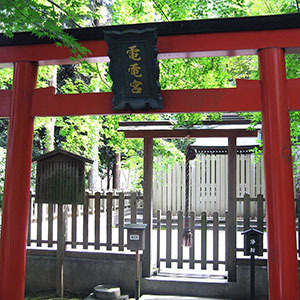 At Horin-ji Temple, we refer to the ancient procedure of worship service which is also considered the most respectful way by dedicating a handwritten copy of a sutra to the Buddha. For those who want to perform the ceremony, we will receive one Chinese character written by you and dedicate it to the Kokuzo Bosatsu as a “one word copy of sutra”. During the following periods written as below, your name will be read aloud and the Chinese character you wrote down will represent your in the praying ritual. We will charge you the fee of ceremony according to the time period you would like us to perform the ritual for you.